The Temple of Apollo Epicurius at Bassae was an Ancient Greek temple known for its architecture. It is located in a rural location and was dedicated to the god of healing. The temple was built from 420 to 400 BC. Its architect probably was Iktinos. 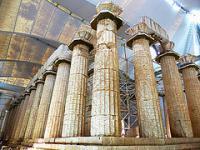 It is a Doric temple, with dimensions of 14.48 x 38.24 m. Part of it is modelled after the temple of Apollo at Delphi. The originality of this monument lies in its internal design. A 31 meter long frieze encircled the inside on all four sides. This masterpiece has been transported to the British Museum in London. The temple also boasts the oldest Corinthian capital that has so far been found. At a height of 1130 meter, it was freezing cold. Snow covered the surroundings. I was a lonely visitor, again. You must be mad to visit a site like this in winter, but well, I was in the area and just couldn't drive past it. Due to extensive restauration works, the temple now lies beneath a large tent. This tent has to guard the ancient building from the sometimes severe weather conditions around here. Also precautions are taken against damage that can be done by earthquakes. Once the work is completed (who knows when), the temple will be back in open air. Because of the works going on, not much can be seen of this precious temple. You can only view the columns from the outside, but the inside is forbidden terrain. That's a pity, I'll have to return in a few years to see what they have made of it. Site visited in December 2018. The temple is not isolated as it seems. It can be reached by taxi (not too expensive) from Andritsaina or Figaleia, both connected by buses from Pirgos (Andritsaina also from Tripolis), only during the week days, no weekends. I’ve chosen Andritsaina, taking a bus at 6:15 from Pirgos – it takes 1 hour and 45 minutes to get there; after arriving in the village, I had a coffee in a small restaurant where I left my backpack and the owner arrange a taxi for the temple – only one way, cos I decided to walk down the 14 km road from the temple just to catch a returning bus to Pirgos at 2pm. The temple is still covered with a bit worn-out and dirty tent, but even so, it makes a very good impression. Being one of the best preserved from antiquity, it still needs some (huge!) repair and reconstruction works before the tent can be taken off. Inside the tent you can watch an informative movie about the reconstructions. The remaining columns and walls make you feel so small when you’re so closed to them; there are still lots of scaffoldings and other hardware upholding the structure. Lots of numbered pieces of the temple roof around. And lots of cats too. I was the only person visiting that morning so the lady selling tickets walked with me around and pointed elements that shouldn’t be missed, like the old temple west of the present one (you can see only some foundation), the remains of ionic columns, special structure of the platform, vestiges of the civil buildings to the east of the temple, the exact place where the statue of Apollo and the Corinthian column was located… She told me about the EW location and the southern door and also mentioned about pre-mythical beliefs that influenced temple position. This is for sure not the site that puts a spell on you, but I really enjoyed spending one hour there and the long way back to the village. A few points about Bassae following our visit in Oct 2017. Bassae doesn’t exactly “wow” at first sight. It is certainly wildly and remotely situated but, beyond that, lacks what I might call “first order appeal” (look at its “rating” on this site!). It consists primarily of a rectangle of crumbling pillars, plus some “internal walls” - all much smaller and less “impressive” than its “big brother”, the Parthenon, with which it is approximately contemporaneous (c450-400BC). All is hidden under a rather grubby, disintegrating tent which has been in place since 1987 during a “long term” (!!) restoration project. The tent of course totally destroys one of the building’s main attributes - namely its relationship with its setting. Early photos in the next link below show it in its unshrouded glory. Back in Athens, the queues for the Parthenon would no doubt have been reaching epic proportions, but at Bassae we were almost alone. There was, however, a group of US graduate school students who were being shown round by a professor from Oxford - so we “followed” them. And he found plenty to talk about – its location, its orientation, its internal layout, its proportions, its decoration, its religious uses, who built it, who copied it etc etc! 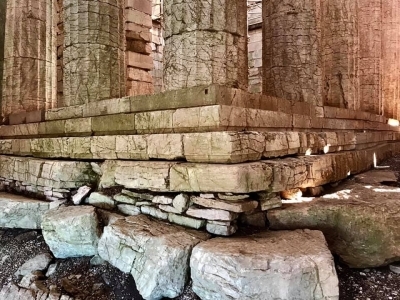 Wiki says “Although this temple is geographically remote from major polities of ancient Greece, it is one of the most studied ancient Greek temples because of its multitude of unusual features” - a WHS for cognoscenti of Greek history and architecture I guess! Much of Bassae’s architectural significance lies in aspects which have been removed, have disappeared or are the subject of debate. 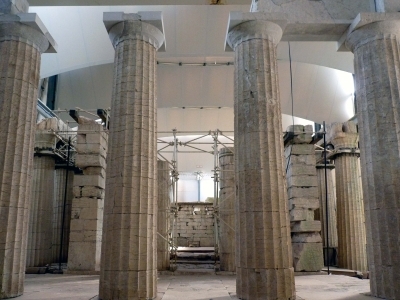 The Temple was unique in (originally) possessing examples of all three “ancient orders” of architecture - in particular of the “earliest” Corinthian column discovered to date. This was placed “dead centre” as a stand alone column - a fact which has been the subject of many a research paper on why and what it was used for etc. Little more than its base seems to be present now. This can be seen with difficulty through the external pillars and is currently surrounded by a wooden barrier (Photo – up steps in centre distance). I have looked in vain for any earlier photos, on the basis that the column itself might have been removed for the duration of the restoration. It is certainly the case however that the distinctive Corinthian acanthus-leaved capital has gone for ever - having been “lost at sea”. Luckily the 19th C archaeologists had made a drawing of it! And this is another WHS about which there are complex theories regarding its relationship to the movement of the Sun (It was dedicated to Apollo so that makes sense of course). As our Oxford Professor pointed out, this Greek Temple is one of few which is oriented North/South rather than East/West. But why? Was it “forced” by the land on which it was built? In fact this orientation goes back to an archaic temple built centuries before the “Classical” version whose remains we see now and I have read that it could be due to its Arcadian religious “roots” – the Greek pantheon and its rituals didn’t come down from Olympus fully formed in one go but were developed across many centuries from the myths of earlier cultures!!. The existence of both a Northern and an Eastern entrance seems significant with the latter permitting the Sun’s rays to enter the heart of the Temple at certain times (“a door was placed in the side of the temple, perhaps to let light in to illuminate the cult statue” Wiki). This article for download indicates one theory. Just a few months later, we visited another European archaeological site which is also “unusually oriented” in comparison with most of its cultural siblings - namely the Menga Dolmen at Antequera . It too is the subject of much speculation regarding its relationship to the Solstice - see my review . Are ancient sites particularly at the “mercy” of those who are driven to spend their lives looking for such astronomical “alignments” - and somehow always manage to find them! Or is it reasonable to believe that all ancient cultures both knew and could forecast the regularity of heavenly bodies and regarded these as significant when locating/designing and constructing their places of ritual and worship? My scepticism is not totally extinguished on this matter but I am prepared to give the possibility some credence! Outside the tent, on terraces cleared and levelled for the purpose, a vast array of stones stands neatly lined up in rows - each identified and catalogued. But “using them up” doesn’t seem to figure in the tasks shown in video about the restoration which plays continuously inside the tent (as described by John Booth below). In fact ancient Bassae consisted of a “sanctuary” complex with elements in addition to the central temple so, no doubt, many stones came from these other structures. This article from 2018 indicates the “geological” pace of progress on restoration and highlights that the work shown in the video is actually only a subproject of a phase on a small part of the temple and has, in any case, been at a halt for 3 years due to lack of money. It could yet be many years before the tent is removed or even replaced with a new one! b. The Frieze in the British Museum (BM). Among all those stones, you will see some which are laid out in a rectangle on the ground. These are identified as having formed the architrave on which the “Bassae frieze” once rested. A notice board states “After its looting by the so-called “excavators” the frieze and other sculptures of the temple had been transferred to England (1814) and resulted in the British Museum (1815) where they are now exposed” (sic). Yes - in addition to the Elgin Marbles, the BM possesses another early “acquisition” from Greece! Excavations were carried out by a “multi-national” group of European artists and architects and the British government bought the frieze from them at auction in Xante. Whether this really provided “legal title” I don’t know - at least Lord Elgin had a “Firmin” from the Ottoman rulers to take and ship the “marbles” which the British government bought a year later. Other “bits of Bassae” are widely scattered including in Moscow’s Pushkin Museum – and even some in Athens! The BM also holds other smaller fragments of the structure – 374 in all!!! These include what is apparently the only remaining fragment of the temple’s Ionic capital. You can see them here (scroll down). c. Getting there by Car from Athens. Our Navmii GPS and Google Maps both selected a “shortest” route which, at/near Megalopolis, takes a direct but very “minor” road through the village of Lykaio before joining the improved road from Andritsaina at 37.452509, 21.921676 around 4 kms north of Bassae. It is a nice scenic road (with forests full of wonderful cyclamen when we were there) but, particularly after Lykaio, is rather rough and often unsurfaced/potholed – not a good idea in poor/wet weather in a small saloon! If your prime aim is to get to/from Bassae ASAP then force the use of Route 76 all the way via Andritsaina (as we did for our return)!! Watching the audio-visual presentation about the restoration work I began to realise the extent of the work being performed. Each column was being raised off its foundation, a new earthquake-proof foundation was then constructed beneath. The columns were then lowered back precisely into their original positions. Inevitably this is a very slow, painstaking and expensive process. After some 15 years about one third of the columns have been treated. So don't expect the tent shrouding the temple to be removed for a few decades yet. Around the site are neatly catalogued rows of stones to be replaced as roof beams etc. I visited this WHS in June 2014. You don't get here by chance! No doubt about that! 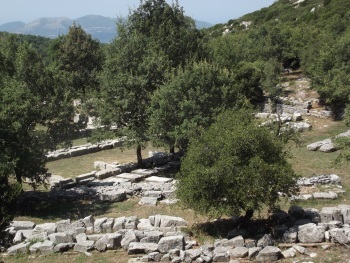 The Temple of Apollo Epicurius is well hidden in the Arcadian Mountains at 1131m above sea level. From Ancient Olympia to this WHS there was a difference of 20 degrees, so I would definitely recommend visiting in the summer. 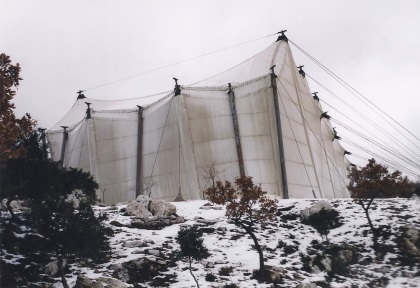 The mountain scenery was amazing to take in and then about 14km from Andritsaina I saw the white protective tent that covers this WHS since 1987. I have mixed feelings about this tent. While I support the idea of protecting the temple from the elements (mainly ice, wind, rain and sun) it would obviously be a greater sight to behold without the tent. Moreover, the tent needs to be taken care of as parts of it got torn and quite a lot of rainwater and mud got on the doric columns and on the information display screens which were switched off and don't work anymore. This WHS was the first inscribed WHS from Greece in 1986 and is worth a visit if you're nearby. I visited Bassae in 1959 when the road tomit had only recently been built and was still a dirt road. The site and particularly the condition of this temple were magnificent. I can not understand why it has been necessary to encase it in a tent and risk damage from damp to a structure which has successfully survived 2400 plus years. Please finish your works, if indeed they are necessary, and reopen it to its proper inspirational position on the mountain top. I was on my own travelling around southern Greece in 2008 and stayed the night in Andritsena as for ages I had wanted to see the temple at Bassae. Staying at another room in the house was a couple who were cycling on a tandem from Rome to Athens. The following morning the man asked if I could give him a lift in my car to the temple as he didn't want to cycle all that way uphill! So I took him even though I had already been the day before and somehow as I was sharing the experience with another it meant so much more to me this second time. It was a Saturday morning and no one else was around: it was bright but cold and seeing that lovely building again with someone to discuss it with was terrific. I'll go again one day but we went back in the car to Andritsena and they cycled onwards to Athens: I don't know who they were but he helped me enjoy my time at Bassae so much. I have visited three times the temple. The temple is in a great danger because of the humidity. The textile cover supposed to be temporary but is more than 24 years that is still there. Even though the temple of Epicurius Apollo is being restorated at the moment and sheltered by a large tent, I found it to be breathtakingly beautiful. I can recommend it to everyone. The best way to go there is south from Andritsaina. We made the mistake to drive north from Kopanaki: a 2 - 2,5 hour drive through the mountains. I visited Bassae in 1975. The trip from the coast to get there was through beautiful mountain scenery. As we got closer to the temple the road deteriorated and was full of portions that had broken off and fallen down the slope of the hills. It became foggy and suddenly a few goats suddenly darted across the road (omens of the gods?). Arriving at the temple my wife and I were the only ones there (except for our cab driver). The isolation and fog made for a magical feeling. The temple wasn't enclosed in a tent then, there was no admission fee, and you could wander wherever you wanted. The temple was maginificent, very well preserved, and worth the long trip to get there. 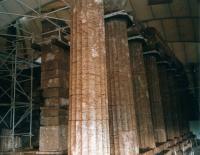 Its interior layout was unlike any of the many Greek temples that I have visited. It was a most memorable visit. 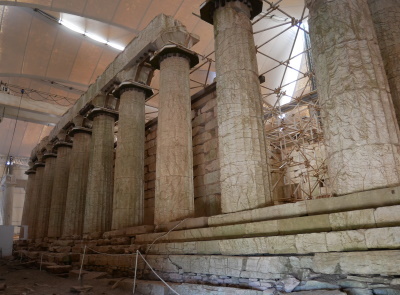 In our trip to Greece we have visited the stunning ruins of the temple of Bassae, dedicated by the ancient inhabitants of Phigalia to Apollo Epicurius, the god solar and healer who had come to help them when they were beset by an epidemic of the plague, during the war of the Peloponnese. It was built in the 5th century B.C. (in the opinion of Pausanias by the architect Ictinos, the constructer of the Parthenon, on the place of an earlier temple) near the present village of Andritsaina, on a mount 1130 m high, and belongs to the fist generation of post-Parthenonian buildings. It remained undiscovered because of its isolation, until a French architect came upon it accidentally in 1765 and brought it to the attention of the academic world; the archeological investigation were profitable but prejudicial to the integrity of the monument, that was divested of the internal architrave of the cella, with the Ionic 22 frieze’s sculptured plates (with the Centauromachy and the Amazonomachy, maybe sculpted by Kallimachos), acquired in 1814 by order of the future king George IV of England and transferred to the British Museum with the oldest Corinthian capital. It was restored in 1902 and in 1965 and is now entirely shored up and covered by a tent (the restoration and consolidation works continue), because its critical state. The peripteral building, 39.87 m long and 16.13 m large, is oriented to the north and not to the east, as usual. In Doric order is the outer colonnade, with preserved architraves and six columns on the fronts and fifteen on the sides, and the front of the pronaos and the opisthodomos (that didn’t give access to the temple), with two in antis columns. In the cella are two rows (that form a sort of lateral niches) of four imbedded Ionic columns standing against and in parallel with low support walls, each ending with an imbedded diagonal Corinthian column. Between them, in the centre of the temple, is one alone Corinthian column, the most ancient conserved, that separated the cella and the adyton, the room where was conserved the statue of the god, with an opening on the east wall, direction in which were oriented all the other temples. The walls, the bases and the tambours of the columns are made of local grey limestone and the Ionic and Corinthian capitals, the sculptured metopes on the exterior frieze of the cella, the plates of the Ionic frieze which runs along the inside of the sanctuary, the guttae, the roof supports and the roofing tiles are made of Doliana marble. This temple is one of the most beautiful places I have ever seen, because of the quality of its architecture, even if I was at first disappointed by the tent that cover it and by its state of conservation. It’s absolutely worth to be visited (even if it’s difficult to get there), also because it is one of the most preserved Greek temples and the most unusual one, and justifies the inscription. Approaching this out of the way site, it looks like a disused masons yard with a gigantic tent at its edge. But once inside the tent, which is truely enormous, you are treated to a sight which is awe inspiring in its magnificence. I was immediately struck by its sanctity, even though I am not a particularly religious person myself. All hail to UNESCO and others who are working so hard to preserve this wonderful temple. A temple must be open to the sky and to the gods -- this tent destroys the temple as a temple. In the British museum: "Bassae Sculptures" - Twenty three blocks from the frieze that ran around the interior of the building showing the battle between the Greeks and Amazons and the Lapiths and Centaurs. Modelled after: Part of it is modelled after the temple of Apollo at Delphi.